There are allegations that the two new members were members of organisations banned for Assembly Members to be a part of due to the possible conflict of interest. Aled Roberts (North Wales) and John Dixon (South Wales Central) were selected through the regional list system, which should make it easier for the AMs to have their seats declared vacant if they are found to break election rules. This is due to it being a party list system where the next one on the list will now most likely take their places. Aled Roberts had been a member of the Valuation Tribunal for Wales, while Dixon was still a member of the Care Council for Wales (an organisation which regulates social care workers in Wales) the day he was elected. Both of the members had resigned from the organisations once it became apparent that they were on the banned list. The complaint was made by the Welsh UKIP MEP John Bufton to the police forces in the two respective areas. There is an issue that one of the members under investigation was provided with out of date materials, however the old saying, ignorance of the law is no defence, seems appropriate. When questioned on the matter Presiding Officer Rosemary Butler said: “I take it very seriously because standards in public life are very, very important and the reputation of the Assembly is highly significant, so it really is for the members to decide how they will take this forward.” The Welsh Liberal Democrats had wanted the two men reinstated as members, declaring that the situation was an unfortunate administrative error. The fate of the two men now looks very bleak and very early in to what they may have considered as a new start in their career. A former Counsel General Winston Roddrick, has argued that the two men’s election is void and that their seats should be made vacant so a proper valid election can take place. Thus the next few weeks shall prove to be interesting, as we wait to see the fate of the two members. It will also be interesting to see how this will leave the Liberal Democrats, who are now down to only 3 members who are eligible to vote in the chamber. 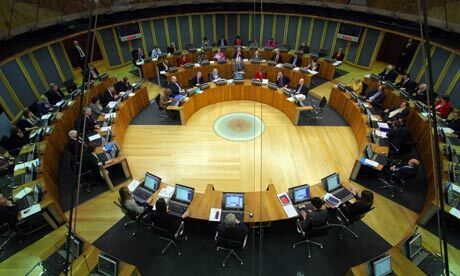 This affair has proven to be an embarrassing start to the fourth assembly, the Liberal Democrats having to feel the pain twice in one month; the first being their national humiliation at the recent elections. The most likely fate of the suspended Assembly members is that their seats will be declared vacant and the number two’s on the list will become the new AMs, but again it is for the police to also decide as it is a criminal investigation after all.